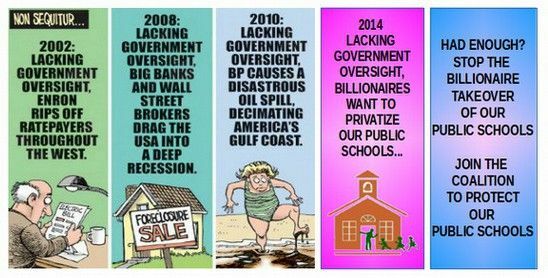 The Billionaire Plan to Destroy our public schools... and what you can do to stop them! This website covers only a portion of the information available in our book. Please email the link to this website to your friends and neighbors...Together we can stop the billionaires from destroying our public schools! To order a paperback copy of our book, Weapons of Mass Deception,CLICK HERE! To order a PDF or EPUB copy of our book, Weapons of Mass Deception, CLICK HERE! To order the Kindle version of our book, Weapons of Mass Deception, CLICK HERE! Welcome to our website and book on how weapons of mass deception are being used to destroy and take over our public schools. We are two teachers in Washington State. Together we have more than 50 years of experience teaching public school and community college courses. We are also both parents concerned about the future of our children and the future of all children. As parents and teachers, we believe every child deserves a real school, a real teacher and a quality education. Our goal is to explain the dangerous drawbacks of privatizing our public schools and provide parents and teachers with options for REAL education reform. Our purpose is to alert you to the many attacks on our public schools and the horrific harm these attacks are currently inflicting on millions of school children. Our mission is to arm you with useful ideas on what you can do to fight back against these attacks. 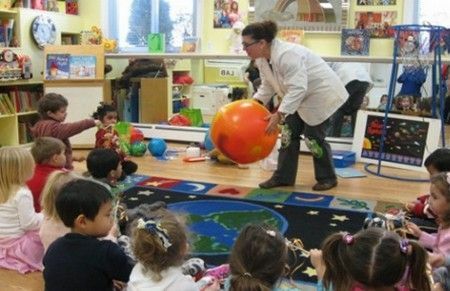 According to the National Center for Educational Statistics, there are about 52 million school age children in the United States. Each of the 13 grades has about 4 million students. The average graduation rate for the past 40 years has been about 75% - meaning that about one in four students – or nearly one million students – do not get a high school diploma each year. About 90% of these one million drop outs (or 900,000 young adults) eventually attempt to get a High School Equivalency Diploma each year, called a GED certificate – which is pretty much required to get a good job or go to a good college. Historically, for the past 40 years, the exam questions were selected so that about 60% or about 540,000 of these 900,000 mostly low income young adults got their GED certificate every year. However, in spring, 2014, we became aware of a shocking decline in the pass rate of GED students at local community colleges here in Washington State. The cause of this decline was a new GED test called the 2014 Pearson GED test. This new GED test has exam questions that are much more difficult than the previous GED test. In March of 2014, based on our analysis of the difficulty of these questions, we estimated that this new GED test would result in the pass rate falling from 540,000 students (a 60% pass rate) to less than 90,000 students (a 10% pass rate) - preventing nearly 500,000 students across the US from receiving their GED certificate in 2014. Sadly, we were proven correct. Here is an article from December 17 2014 with that exact headline! We gave a new Pearson GED practice math test to over 50 people, most of whom had college degrees and only 4 people could pass it. Pearson, the designer of this new test, claimed that the new GED test has to be harder because it is “aligned to Common Core standards.” This led us to research the Common Core standards and their relationship to high stakes testing. What we found was so appalling, we decided we needed to write this book in order to expose the scam of common core fake standards and its high stakes high failure rate tests. 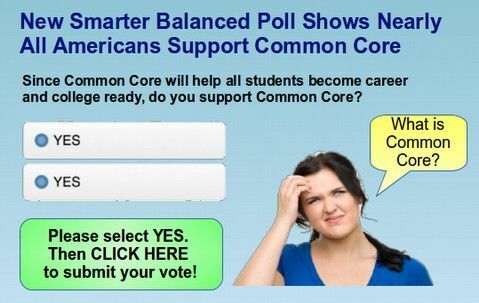 Specifically, of the 30 million school children who will take the new Common Core tests in the spring of 2015, we predict based upon the difficulty of the new test questions that more than 20 million students will unfairly be labeled as failures by the new Common Core tests (called SBAC and PARCC). In fact, none of these kids are failures. It is the Common Core system that is a failure. This book exposes seven blatant lies used by the ed reform movement. These seven weapons are Drill and Kill fake tests, Common Core fake standards, Charter School kid prisons, K12 INC online fake schools, TFA Fake Teachers, Billionaire Funded fake grassroots and Corporate Controlled Fake Government. We call these lies “Weapons of Mass Deception” because they have been used to fool millions of parents and harm millions of children. Common Core High Stakes High Failure Rate tests will harm more than 20 million students just in 2015. But we are not the first to point out that the Ed Reform scam is based on a series of blatant lies. For nearly 20 years, there have been a series of good books exposing the crimes of the ed reform scam and how these crimes harm our kids. Despite the mountain of evidence that school reform has caused severe harm to our students (and hundreds of billions of wasted tax payer dollars), the billionaires war against our public schools continues unabated. Because of the insane dictates of “No Child Left Behind” combined with its terrible twin “Race to the Top,” nearly every school in America is now rated as a failure while our children are subjected to toxic “Common Core” tests designed to fail at least 66% of them. This failure to protect our public schools is not the fault of any of the brave authors listed above. 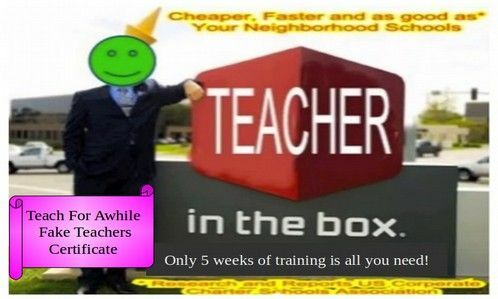 It is difficult to see through the propaganda blitz of billionaires who are able to buy off the media, buy up the government and create a massive hoax of fake foundations, fake think tanks, fake non-profits and fake educational organizations to deceive the public into believing that there is merit to the billionaire plan to take over and privatize our public schools. Our goal is to expose the billionaires plan by exposing all of the weapons they are using against our kids and our schools. As teachers with more than 50 years of experience between the two of us, we know that images matter. Our goal is a book that tells the story as much through images as through text. There are more than two hundred images in this book. This has doubled the length of the book from 200 to 400 pages. Our hope is that adding these images will help more readers better understand how they are being manipulated by the mass media propaganda paid for by the billionaires. Many folks mistakenly assume that all of the actions of the billionaires are simply a bunch of unrelated random errors made by billionaires who are simply misinformed. But the things that may appear on the surface to be merely just unlucky coincidences actually work together to achieve a real goal which is to privatize and take over our public schools. The billionaires want to destroy our public schools so that we parents will be forced to send our kids to “charter schools” controlled for and by billionaires - rather than public schools controlled by parents through our locally elected school boards. This may seem like a conspiracy theory to some. But read our book and we think you'll discover as we did that a deliberate billionaire takeover of our public schools is exactly what is going on. 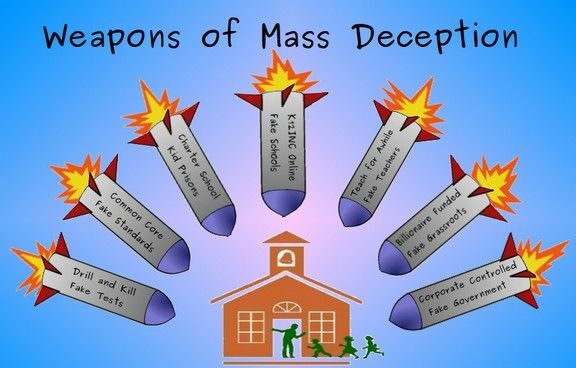 We intend to expose how each of their 7 Weapons of Mass Deception used to take over our public schools are connected. 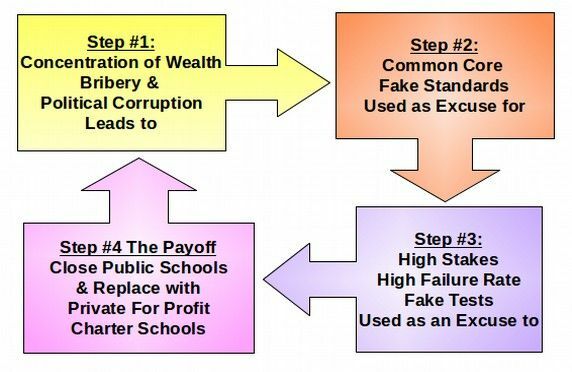 Parents, teachers, school administrators, PTA members, school boards and community members need to understand the connections between high stakes tests, common core standards, charter schools, online schools and fake teacher scams like Teach For America. In this book we explain not only what is happening – but why it is happening and how each leg of the elephant is connected to every other leg of the elephant. Our research indicates that the Ed Reform movement is being driven by a few billionaires interested in maximizing their corporate profits. Are we being to harsh on the billionaires? Throughout this book, you will see example after example of disastrous ed reform scams being funded by billionaires. 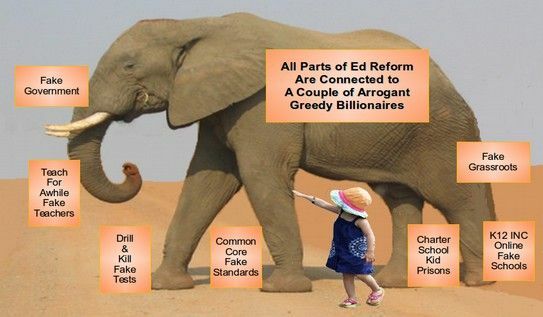 It would not be accurate to discuss these ed reform scams without talking about the billionaires funding those scams. Some people have protested that we are being too harsh on the billionaires. 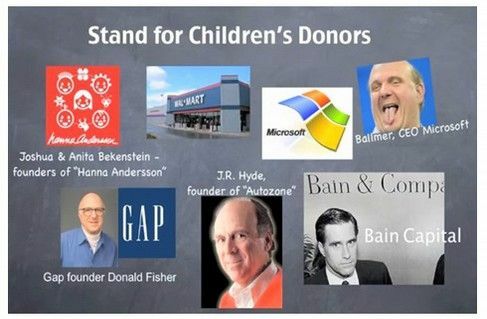 They claim that the billionaires are simply misguided and do not realize that they are harming millions of children in their efforts to privatize our public schools. However, we believe that there is a deliberate pattern to the actions of the billionaires. Naomi Klein refers to this pattern as the “Shock Doctrine.” The idea is that the wealthy promote chaos and then use that chaos to make changes that benefit the wealthy. Noam Chomsky also sees the familiar pattern to the Shock Doctrine used to privatize our public schools. Our research has taught us that there has been a massive transfer of wealth over the last several decades. This wealth transfer is what is hurting our children and overcrowding our schools. There is plenty of money. It's just not moving among the people. 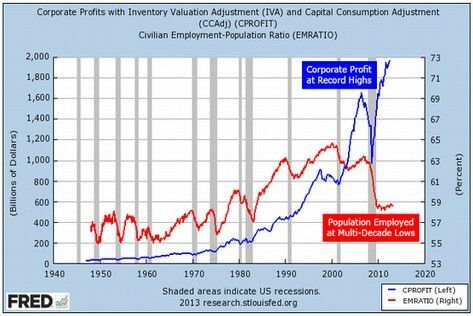 Below is a chart showing that while the percentage of people in the work force is at a 30 year low, corporate profits are at an all time high. Many people assume that billionaires have good intentions and all we need to do is explain to the billionaires why what they are doing is wrong and how much it harms kids and then the billionaires will stop. Unfortunately, not everyone in the world shares our values. Billionaires, as we will expose in this book, think much differently than the rest of us. They are so arrogant that they think our schools, our economy and even our political system would be better off if they ran them. We also falsely assume our elected leaders will care if they are made more aware of the harm fake ed reform inflicts on our kids. Sadly, this is not the case as most elected officials only care about keeping the billionaires who paid for their elections happy. So we need a book which more realistically addresses the war that is being waged against our kids and our public schools. There are hundreds of billions of dollars at stake – as well as the future of 52 million school children. So we wrote a book which realistically addresses the war that is being waged against our kids and our public schools. Our book is more direct in tone than most of the other books. We name names across the political spectrum and from the halls of corporate America. Many of these are names you'll recognize. Finally, we want to arm you with the specific and credible information you need to combat each of the seven weapons of mass deception in order that we can keep and strengthen our public schools. Our public schools represent the future of our children and of our democracy. But in the eyes of the greedy and powerful, our schools are a “market” worth nearly one trillion dollars annually. 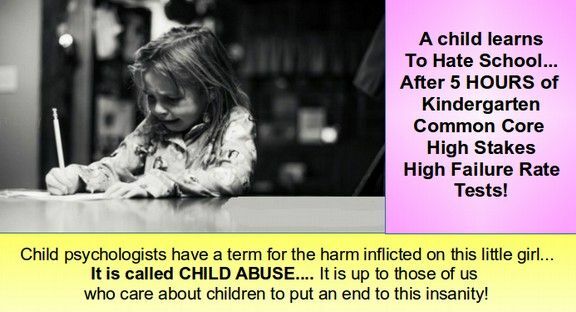 Let's not allow our children to be made into commodities to buy and sell. It will take all hands on deck if we are to to defeat the billionaires. We hope you'll join us! 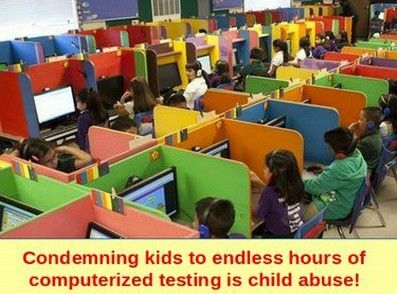 #1: Drill and Kill Fake Tests... A program of endless high stakes tests intended to unfairly and dishonestly brand every public school in America as a failure by forcing our kids to take tests deliberately designed to fail as many students as possible. 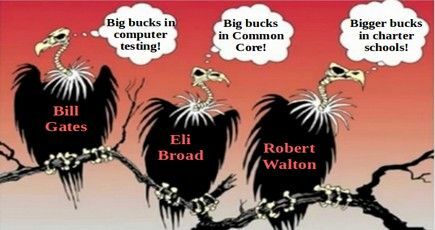 #2: Common Core Fake Standards... A poorly designed set of national standards that were developed by billionaires rather than educators and intended to act as a smoke screen to force new “impossible to pass” tests on our public schools. 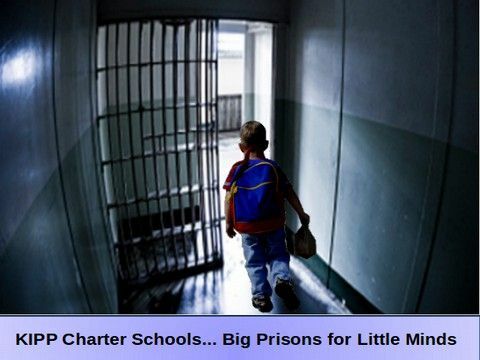 #3: Charter School Kid Prisons... Charters not only rob tax payers of billions of dollars, but also rob young children of their childhood. We will describe just a few of the many shocking abuses created by unregulated and out of control charter school greed, including KIPP schools – the Kids In Prison Program. #4: K12INC Online Fake Schools... In this Wall Street scam, half the kids drop out every year, teachers are forced to monitor 300 students every day and the graduation rate is only 22%. Fake Online Schools severely harm millions of children. #6: Billionaire Funded Fake Grassroots... Billionaires have spent millions of dollars of tax diversion funds through money laundering "foundations" to prop up and promote fake non profit groups with deceptive names like “Stand for Children” to build an army of thousands of corporate lobbyists to fool parents and legislators into unwittingly supporting the destruction of our public schools. #7: Corporate Controlled Fake Government... Corporate control and deregulation has already destroyed our health care system, our energy network, our banking system and our economy. It's impact on public schools will be even worse. #8... Real Education Reform. In the final chapter, we will explain how to achieve real education reform to actually improve rather than destroy our public schools. These steps include restoring school funding by rolling back corporate tax breaks and lowering class sizes so struggling students can get the help they need to graduate. We hope you will take the time to learn more about the attacks on our public schools and what you can do to protect them. If you agree with us that our schools are under attack, we hope you will share the link to this book with your friends, family and neighbors. If you have any questions, feel free to post them on our community forum located at Weapons of Mass Deception (dot) org.